Today’s story is about 3 women, 3 worlds apart and how it all came together to this day. You will find out about the rest of the characters as my story unfold – 3 Blogs – a Book – a (Pinterest) Board – a Bakery – a Busstop – a Bassett – a Best friend – a Bond – Blessings – a Blue envelope and a Bootcamp. Sitting at my desk, I reflect on the unfolding of this story over the past 2 years. But it comes not from my desk, but straight from my heart. It all started when I started a blog…. way back when….yes – I knew absolutely nothing about it, but just wanted in ! On the blogging bandwagon I jumped with both feet, arms up in the air ! 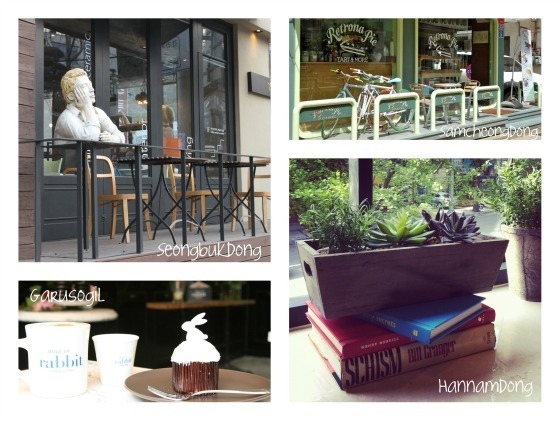 One day I was browsing around on the internet and stumbled upon the beautiful blog of Holly Becker from decor8. It took me about a second to realize just exactly HOW little I knew about blogging. I spotted her link on the side inviting me to join an online-course and in desperate need for help I signed up ! It was incredibly inspiring and I had big plans for my blog. But life carries on while you dream your dreams and in the last week of our course my mother passed away. My blog provided me with comfort in coping with this loss, but along with her burial and a period of grief, I also buried a lot of the plans for my blog. Death of a loved one tends to take your focus and divert it to your mourning heart. Sharing my burden through my blog did however help me to keep myself together and soon I was ready to blog, tweet and pin to my heart’s content again! The Turn in the Tale came in June 2011 when I joined in on a fun experiment , again hosted by Holly, called Stripemania. Holly created a Pinterest board for this and needed my location to add to my entry and oh my – not only did I discover Pinterest this way (THANK YOU, THANK YOU HOLLY !!!) …..but as I told her that I was in Seoul, South Korea – she tweeted back (from Germany) asking if I knew Moline, a lady who recently moved from Germany to South Korea. I did not. Sidenote – still amazes me how 2 people who have never spoken or seen each other can tweet from across 2 continents, without saying hello…without saying goodbye…but having the middle part of a traditional conversation in less than 140 characters. The wonderfulful world of modern day social media. So, if you have not been convinced of social media benefits – today is your day ! A simple tweet can be life-changing. You know Moline? She lives in Seoul. Click. Bye. Conversation over. Isn’t that amazing – and that is what Twitter brought to us !! But that, my dear reader, is not where the story ended. That really was the BEGINNING . Hastily I searched Moline… and good old Google ranked a blog called Moline as the nr 1 find. I followed the link and as the images loaded, a life unfolded in front of me of a hearty home and a crafty homemaker with beautiful children and a Basset. Never seen them before. So “Moline” was still as much a stranger as when the question came in an hour earlier. In a city of 14 million people though, it is not surprising to have not run into a person that one person happened to know in a different country. So, what are the odds. 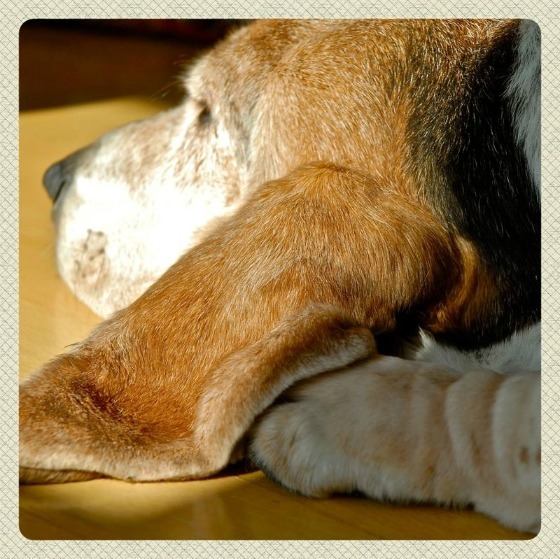 Right that moment my son walks past and spotted a Basset on the blog – “That dog is at our Busstop everyday ” … really?? . I mean REALLY?? I browsed through as many posts as I could and could not believe my own eyes when I realised that Holly had put me in touch, from another world, with a woman who lives up my street, whom I had never seen, met or heard of. I mailed the contact on the blog, she responded …or perhaps, as a true blogger – first checked my blog and then responded – so, comments started streaming in on my blog and I got super excited as I liked her more and more with every response I received. My holiday started the very next day, with no time to meet this “stranger from up my street” – but we arranged a “blind date” upon my return to Korea. A blind date in a bakery followed 2 months later, where I found Yvonne (her real name), only by her description of “look for a tall, Blonde lady with a German accent “. We chatted, we connected, we clicked, we communicated, we simply could not believe how much we had in common as crafty creatures ! and then venturing out…as I found somebody who instantly became a best friend and a bond formed that took us later through trials and tribulations and difficult situations …right to the point, the month before I had to leave, when we found out that we needed the same surgery the same week, for which both of us were blessed , with “benign” as a result …but we could cry and comfort during those times and most of all understand each other so uninterrupted. And life just seemed brighter walking up to a hospital with a friend by my side….especially if she comes dressed up in the Pantone 2012 Color of the Year – Tangerine Tango! Life would have not been the same without that tweet from Holly that night ! We had so much fun…. 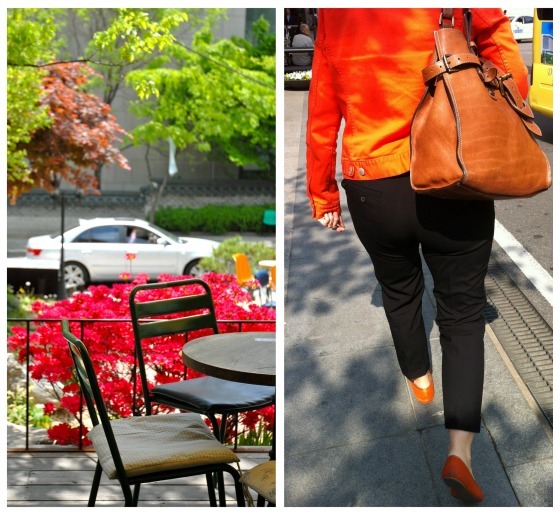 strolling the streets of Seoul…. following paths that lead us to quirky corners where we could capture yet another moment on film for the sake of sharing our stories with the rest of the world – something we both love to do. Happy days had to end as I packed my bags and took off to Hong Kong. 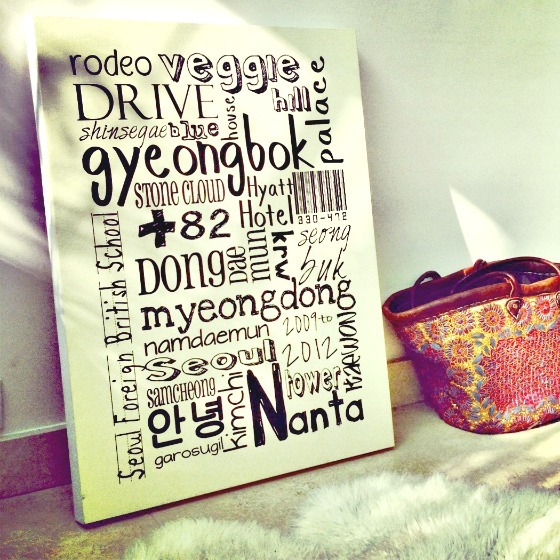 Arriving here, with a home to decorate, and a hole in my heart with nobody to meet in the local bakery, to go venture with me or to inspire me daily in a creative way, I started to stare at the things in my house, missing my old life in Seoul and wondering what to do over here to make a new beginning…. Yvonne soon picked up that I was in a dead-end. Pins started flying my way via mail with new ideas and inspiring schemes that she has concocted for me while I could not see beyond the mover’s boxes. Fast Forward a few weeks and a BLUE Moodboard arrived at my doorstep in the form of a letter. Oh my – did this pick me up from my desperate deco dilemma !! 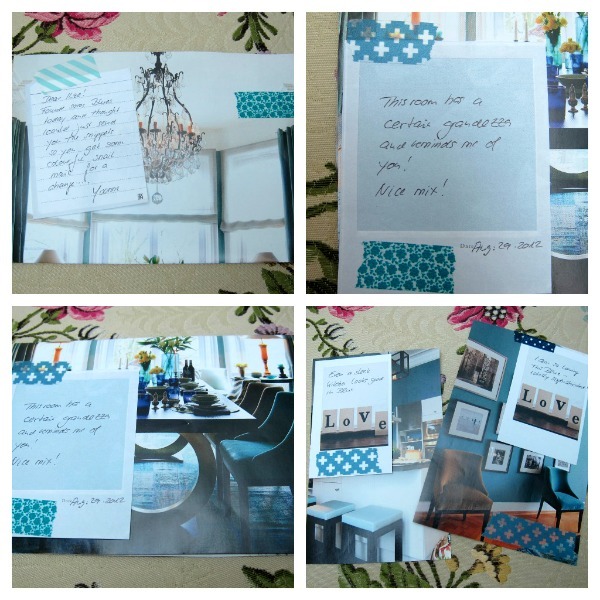 Oh…you can’t make me happier than sending me a self-made envelope with BLUE moodboard snippets from magazines. It was the right pick-me-upper to get my creative juices to start flowing again ! I was excited, but still a bit clueless , so I turned to Holly once again for helping me out. 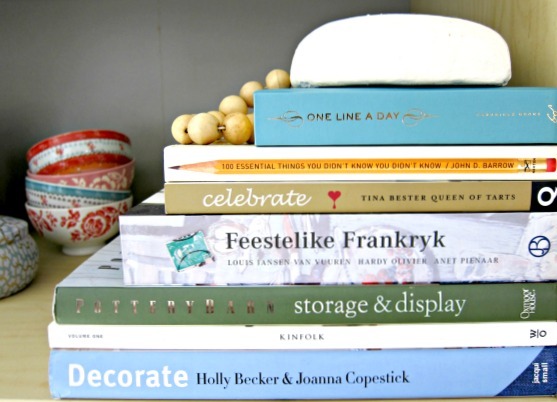 This time in the form of her best-seller book, Decorate, that was so neatly stacked on my shelf. Her book deserves a post of its own, which will follow tomorrow. Being confronted with all the beauty in Holly’s book and all the Pinterest boards Yvonne so delicately shoved under my nose, I could not help but feel my desire to blog, growing again. But I needed a community of bloggers to spur me on and an expert to help me along with those things that got left behind and buried in 2010. Just in time to save me , I spotted the BOOTCAMP that Holly was offering to students who had done her courses before. JUST what the doctor ordered – and here I am today – doing a post for my workshop that started yesterday…. full of excitement and eager to learn a few new things….So much to learn and new things to try out ! Recently I started my blog’s facebook page and if you have not been there, hop on over and like it – that will make me happy too since you will hear of posts hot off the press ! So, if you are a blogger and you are sort of on the sideline whether or not to do a course…. you will make no mistake learning from Holly – she really is the BEST in blogging…..and you might just get a lot more than you bargained for ! Be encouraged today – sign up or start a blog. Social media fostered this relationship and made 3 woman connect in a way that touched 2 lives in a most profound way, for there is nothing like receiving a moodboard in the mail…. to make my day !! This is my story that I wanted to share with you. One with a beginning… but no end. Because a Blogging course lasts a month, but the benefits goes beyond borders and Friendships are Forever. And together with a special friend in real life, I also am gaining wonderful new friends who have signed up with me for the BOOTCAMP and together we grow. Can’t wait to see what is in store for the next chapter ! A really gorgeous story, I’ve just started the byw bootcamp and struggling to get myself motivated! Think my head has been in dream world for too long!! But you have inspired me lots! I’m going to keep an eye on you Grace to see if that inspiration paid off – so you now have a challenge !! What an amazing and inspiring story of blogging friendships! Hi Mary ! Nice to see you here and thanks for your comment !! What a wonderful and inspiring story. It’s truly amazing the boundaries we can breakdown with technology and sometimes comforting how “small” the world really can be. So happy to hear about the great friend you’ve made through the course. Cheers to many more! Very true about the “small” world Jennifer – so be better be accountable on-line…you never know where it catches up with you in real life ! BUT amazing how connected we can be nowadays – and blogging is helping that a lot !! Thx for your comment. OMG, I was just stopping by from BYW to say hello and was completely captivated by your post. What an amazing story. And do beautifully told it brought tears to my eyes. I look forward to following your blog some more. I definitely hope to see you back Jenni!! Thanks so much for letting me know you liked it ! Oh my dear Ilze! You could find me this morning in the bathroom shedding tears over this post! I cannot thank you enough and I am deeply moved by what you wrote! So happy to have found you and as you know: the time in Seoul was just the beginning! Awwwww Yvonne ! I could have made this a book and not a blog post you know – I had to stop myself from not telling about ALL the wonderful things we did – was very tempted to add a Barbie shoot and a Blue on-liner book but had to not put my readers to sleep with 5 pages !!! ;-)) To many more…. Hey gorgeous girl, I hope that we too can become friends. I was going to be happy with online friends but perhaps that will change, given that we found out a few days ago that me are moving to Hong Kong! Something quite unusual happening here. I stumbled across your blog a while ago and was so pleased to have found another SA girl, and one who genuinely blogs from the heart. I’m looking forward to meeting you, because we will meet! And soon! how wonderful!!! I too met Yvonne (Moline) over on Flickr and bloggyland and she is so creative and lovely, its amazing the connections you make via blogs!! you are right Anastasia – I saw you on Yvonne’s Instagram or maybe Flickr – happy to meet you here !! She really is super creative !! And I can browse her Flickr on any rainy day to feel better instantly ! What an amazing story! Loved reading it. Thx a stack Louise ! I actually saw an interesting story in your magazine/blog – I will have to go comment there.. will hop back over there to do that !!! Now THAT is an amazing story. I love that your son was involved too by recognizing Yvonne’s dog! I’m so happy I found your blog (via Pinterest too!) and I’m going to go check out Moline next! I too am taking BYW for the 2nd time and it’s just as great the second time around, especially since I’m in a totally different place now and it feels different, but the same too. I needed the inspiration and am definitely getting it! Without my son, a lot of things would have passed me by in life Anne !! I am happy to be back – definitely feels the same in some ways, but I think I am more capable of taking it in and applying to myself…it was ALL new to me last time – including my struggles with technical stuff…so I am all ears this time round !! Happy I have a mate ! Amazing story. We live in a world of technology which is kinda so dry and uncaring but when you stumble on stories like these you feel like even technology has a great human side to it. Thank you for sharing this story. Yvonne told me about the story in your blog and I was deeply moved. But that’s how expats are living… having to cope with new acquaintances and farewells all the time. Sometimes planned and sometimes unexpectedly. Therefore reading your blog and listening to Yvonne’s stories about your same passions is a wonderful proof that everyone can find a soulmate everywhere in the world. Hi Hye-Jung – so happy you stopped by ! A friend of Yvonne is a friend of mine !! 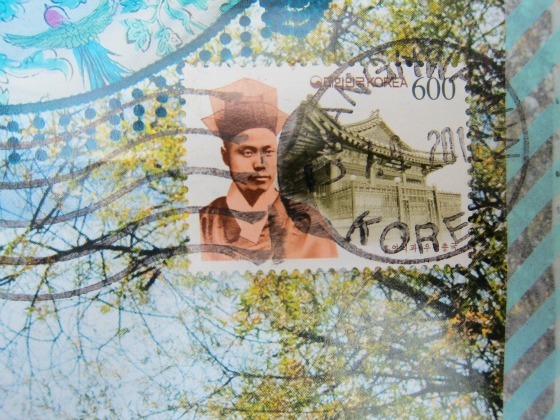 I miss Korea but it is great to stay connected via the online world ! I am always happy for the people I have met and that helps with the sadness to leave – better than never have met them. Hope to see you back here some day ! Hi “Me Plus Molly” – I wanted to leave you a comment on your blog but I could not – due to technical issues of wordpress leaving comments on blogger – anyway – I copy what I wrote there, over here – hope you find it !! 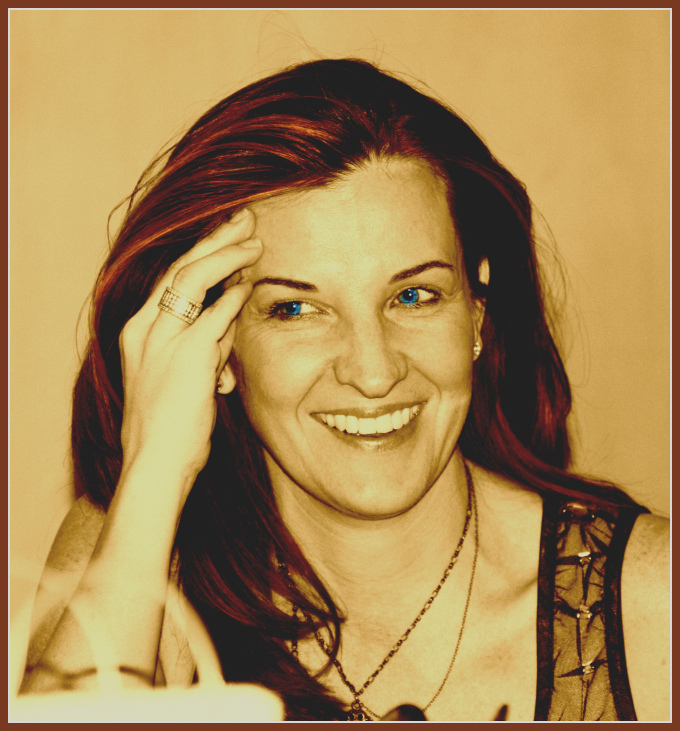 HI Kirsty – I was so intrigued by your name from your comment on my blog – I had to come read here what it is about !! So… I found it – how sweet !! I love your garlands – especially since I have a bee in my bonnet to take the old sheets and bookpages I have and modge podge it to my wall – like a wallpaper?? Only thing – I don’t own this house and a little worried what it would do to the wall. Any opinions? Anyway – I will blog my little experiment if I dare to do !! 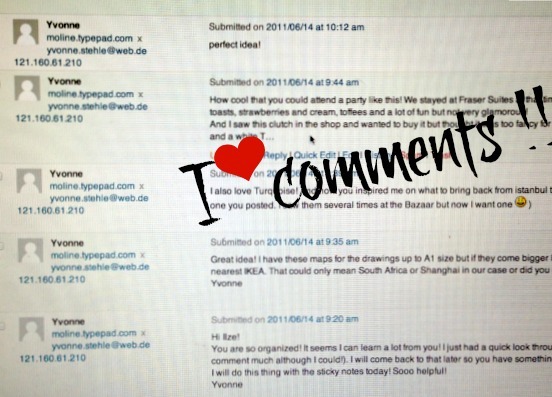 Thx for stopping in at my blog !! 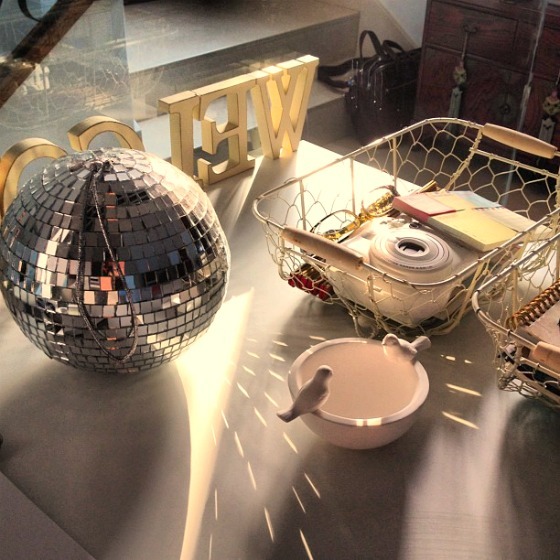 such a beautiful post – so glad I found your blog via BYW. some of my best blogging buddies are a direct result of holly’s classes – pretty small world huh? Oh wow! That story is sooo beautiful. What are the odds that Yvonne would be living in the same street as you? Such an inspirational, motivating, uplifting, heart wawrming story, Ilze. I’m loving BYW Boot Camp and loving the new people I’m meeting along the way. So glad to have found your blog. Love the way you write and look forward to reading lots more here. this is such a nice and heart warming story. And regarding Holly’s class, I am more than happy to have discovered so many talented and creative bloggers in just one week, that I might have never found on my own. Oh! 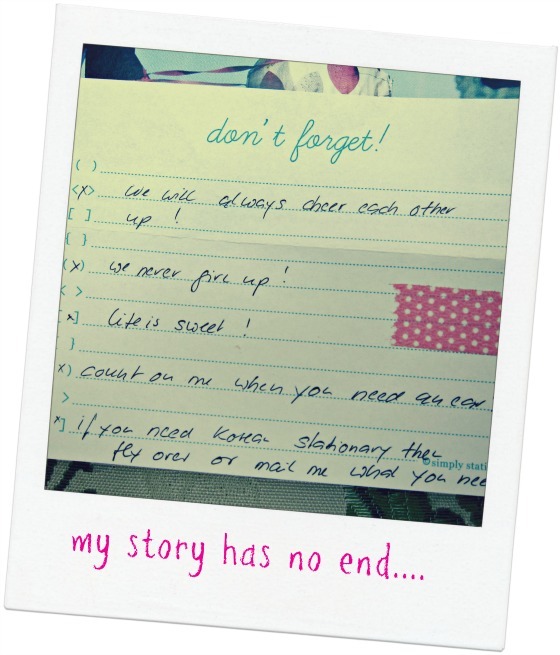 I LOVE your story … thank you for sharing it with us! What a wonderful story Ilze! I am glad I enrolled in the class, and found your blog through it. I hope to meet you someday, Hong Kong isn’t too far from Manila! It has been said so many times, but once again: what a wonderful post! I couldn´t stop reading… I´ve been an expat wife for only two years, and hated it so much that I came back home earlier with the children and asked my husband look for a job at home, at least for a couple of years… I think if I had found a close and like-minded friend like you it would have helped me so much. Maybe next time, maybe through blogging as well..
How wonderful to hear how you can and have met and made wonderful friends blogging! Thanks for sharing! What a beautiful story to have read this morning! Thank you so much for sharing that. I also love how your story touched so many of us readers. It was truly from the heart.